The Israel State’s private attorney tasked with defending the settlement “Regulation Law,” Harel Arnon, told reporters that the recent passage of the Nation-State law (declaring Israel the nation-state of the Jewish people alone) will strengthen his efforts to keeping the Regulation Law on the books (an effort which is widely expected to fail). The settlement “Regulation Law” was passed by the Knesset in February 2017, as a means to allow Israel to expropriate privately owned Palestinian land for the exclusive use/benefit of settlers. The High Court of Justice is currently weighing petitions against the settlement “Regulation Law,” which has been frozen since August 2017. The Nation-State law was passed by the Knesset on July 19th, and has since sparked condemnation and protest for the way it demotes the standing of minority communities in Israel. The law says “the state views the development of Jewish settlement as a national value and will act to encourage and promote its establishment and consolidation.” Nothing in the text suggests a distinction between “Jewish settlement” within Israel’s sovereign borders, and settlement in the occupied territories. 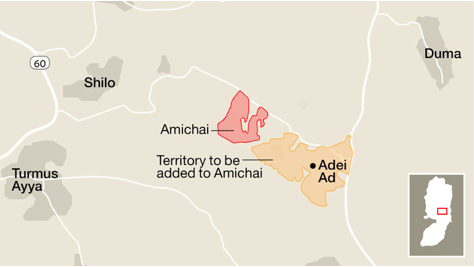 On August 8th, the Israeli Civil Administration announced that it is planning to retroactively legalize the Adei Ad outpost by massively expanding the borders of the (brand new) Amichai settlement to turn Adei Ad into a (non-contiguous) neighborhood of Amichai. In effect, this is a stealth operation by Israel to turn the Adei Ad outpost into an entirely new official, legal settlement. The massive expansion of the Amichai settlement and the transformation of Adei Ad into a brand new settlement, if implemented, will be a significant step towards creating an uninterrupted corridor of settlements connecting sovereign Israel to the Ariel settlement, through the isolated Shiloh Valley settlements, all the way to the Jordan Valley. In so doing, It will completely bisect the northern part of the West Bank. 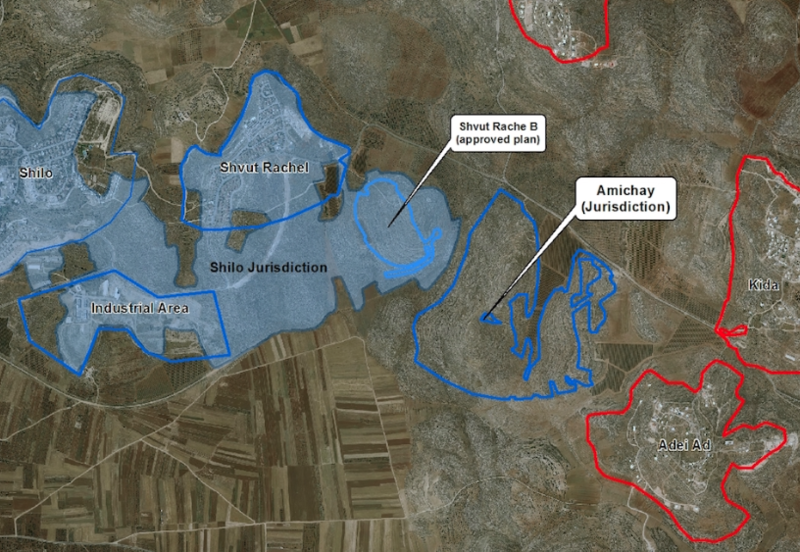 The plan takes into account a Civil Administration “Blue Line” survey in 2017, which found that the strip of land between the Amichai settlement and the Adei Ad outpost is privately owned Palestinian land. 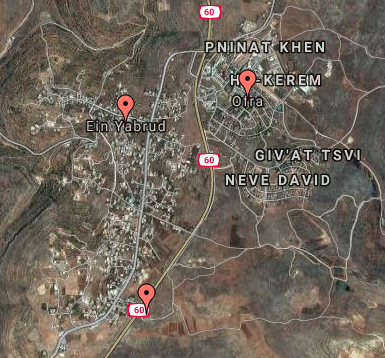 It seems that the Civil Administration is opting (for now) not to use its newly endowed tools for expropriating privately owned land for the use of settlements, and is instead moving forward with a plan that will effectively leave Adei Ad – ostensibly now a neighborhood of Amichai – physically disconnected from its new parent settlement. The strip of Palestinian land in between the two will almost certainly become inaccessible to its Palestinian owners, as is much of the Palestinian land near Adei Ad, a notoriously radical and violent outpost. It is highly likely that at a later date the land will be expropriated. The Civil Administration unveiled the new plan in a letter addressed to Israeli NGO Yesh Din, in response to a 2014 petition against the Adei Ad outpost filed by the group on behalf of Palestinian landowners. The Civil Administration’s letter claimed the 2017 “Blue Line” land survey determined that Adei Ad is built on “state land” and is therefore eligible for retroactive legalization (despite having been built there entirely illegally). Yesh Din and its clients have formally appealed the findings of that survey, contending that Adei Ad is partially on private land. The Times of Israel has a detailed report on a government-funded religious school that for years has been operating illegally in a privately owned Palestinian home near the Ofra settlement, in the center of the West Bank. The Mishpatei Eretz Institute, which is operating the school, receives around USD $55,000 annually from the Israeli Culture Ministry, and has received a total of USD $214,039 from government bodies over the past three years alone. In the mid 1990s the home was physically cut off from the Palestinian village to which it belongs when Israel paved Route 60, the major north-south highway in the West Bank. In 2003, Israeli settlers broke into the home while its owners, the Shehadeh family, were on a day trip to Ramallah. After invading the home, settlers produced forged documents claiming that the Al-Watan settler organization purchased the building, and then spent years trying to prove that the purchase was legitimate in order to have the building registered with the Civil Administration. The Shehadeh family also spent years trying to force the IDF to evict the squatters, but nothing was ever done. In the meantime, Al-Watan donated the building – even without having legally established ownership of it – to the Mishpatei Eretz Institute, which then began operating a religious school in the building with government funding. In 2013, the Jerusalem District Court ruled against Al-Watan’s claim to the building (slamming the organization and its officers for engaging in rampant fraudulent activity), deciding that the documents had been forged and recognizing the original Palestinian owners’ rights. Ten days after the ruling, the IDF Central Command issued a military order seizing the plot of land the home sits on, claiming “security purposes.” The IDF also built a fence around the area. The military order seizing the land will remain in force until 2019. When contacted about the story, the IDF acknowledged the 2013 Court ruling but did not offer an explanation for any of its actions dating to either before or after the court ruling. A lawyer representing the Palestinian owners told The Times of Israel that the family will soon petition the High Court of Justice to have the settlers, and their school, evicted. Haaretz reports that the Israeli government is close to finalizing a new plan to transfer waste from Jerusalem to the West Bank. Under the scheme, Israel will build a waste treatment facility east of the Ma’ale Adumim settlement to handle waste from Jerusalem. The facility will recycle or burn as much of the waste as possible, and then transfer the resulting ash and any remaining waste back into Israel. The Israeli Defense Ministry is slowing down the implementation of the plan, which has broad support across other government ministries, for technical reasons — mainly having to do with a dispute about how the facility will be staffed. The construction of a new, unauthorized observation tower (a memorial site) in the outpost. Construction of the tower moved forward after the High Court of Justice ruled that 17 buildings in Netiv Ha’avot were built partially on Palestinian land and must be demolished. A public campaign to save buildings in the Netiv Ha’avot outpost from demolition, including a payment to the radical Regavim settler organization in connection to the campaign (which is working to selectively enforce building laws against Palestinians in the West Bank). By the end of 2017, the council spent NIS 164,688 on the campaign – which, as Peace Now notes, became an even more active effort in 2018. Building a new (at that point unauthorized) outpost for those settlers facing evacuation from buildings in the Netiv Ha’avot outpost. The Council was able to recoup some of those expenses when the government later approved an NIS 60 million package to provide compensation for the settlers who were evacuated as well as funds for the Council.